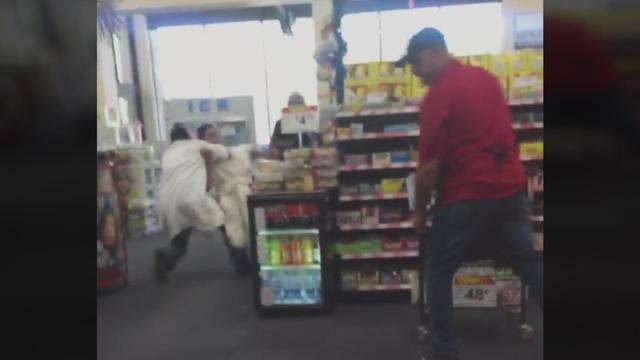 A man shopping at a grocery store in Santa Fe, New Mexico got upset with a security guard for following him around on suspicion of shoplifting. Trouble ensued when the man threw an item at the guard and later pulled a knife on him. A life could have been put at risk with an angry knife-wielding man inside the store. But a butcher stepped in, tackled the man and saved the day. A witness' video captured how the butcher took down the man inside the Santa Fe Food King early Tuesday afternoon. The store butcher pulled the suspect to the ground. The latter part of the video shows several grocery store employees gathering around the suspect and the butcher on the ground. A witness, Donny Robertson, who owns a nearby training business thinks the butcher is the hero of the day. He said:"That guy got exactly what he deserved. (The butcher) possibly could have saved a life, because that guy could have been stabbed. The butcher put his life at risk." Another neighboring business owner, Chris Hill, said he also gives credit to the butcher and also said it’s to his advantage perhaps that he’s not afraid of knives since he deals with knives for his work all the time. Witnesses also say it appears that no one was injured from the incident. The suspect was eventually taken into custody. It remains unclear, however, if any charges were filed against him. NEVER MESS WITH meat cutters aka butchers.. since the prep meat was under the cry o vac process , tno matter how slender or slight or short or tall a meat cutter is… gads they are so toned that no shape of their forms even those with a belly … are definitely not ones to mess with.. and the meat cutters are very good with handling knives… thanks for posting .. hey dad out there …like as if this is news to yah.. gees people still learning of effect of hard work and not to mess with that work FORCE.. oh and vegans ~~eh there is a book for yah all = science based = the secret life of plants ,,, now ya all be nice to those carrots ok.~!